Pirtek USA franchisees worldwide have come from many walks of life, with backgrounds in areas such as banking, sales, marketing, and industrial management. Few, if any, have specific hydraulic training. Operating as a well-supported business format franchise system, a Pirtek franchisee acquires the rights to establish, own, and operate one or more Pirtek centers in exclusive geographic territories. The cost of opening a typical Pirtek Center is approximately $300,000. A prospective franchisee is required to have liquid capital resources of at least $100,000. With this investment, the franchisee will typically start the Pirtek business, which operates from a hose service center sized approximately 2,500-3,500 square feet. Pirtek's "turn-key" system enables the franchisee to open their doors on the first day of business with all elements of their new business in place. Since 1980, Pirtek has developed a strong international presence in 14 countries to include Australia (where it all started! ), Belgium, England, France, Germany, Ireland, Luxemburg, Netherlands, New Zealand, Singapore, Scotland, South Africa, Wales, and the United States. Pirtek now has more than 280 service centers and more than 1,000 mobile service vehicles around the globe. In 1996, Pirtek established itself in the United States with the goal of providing superior products and services to customers involved in industries such as agriculture, building, construction, civil engineering, earth moving, manufacturing, offshore drilling, mining, marine transport, waste, and production. Pirtek's presence as number one in the United States is maintained by the strong commitment to selectively expand its franchise network. 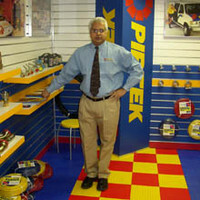 PirtekUSA has the advantage of using techniques developed through years of research by the Pirtek system worldwide. With Pirtek, you have those years of experience and expertise at your side. You are in business for yourself, not by yourself. Whether it's assisting you in finding a suitable location, conducting a regional market analysis or negotiating sales contracts with national customers that benefit local centers, the Pirtek strategic system supports you every step of the way. • "Pirtek has provided me pride of ownership and the joy of managing a small business with its unique service model", Ramdas Iyer owner of Pirtek Newark, New Jersey. • "Today I feel the rewards first-hand of overseeing my team and operating my own business as a Pirtek franchisee", Craig Heitkamp, owner of Pirtek Midway and Pirtek Plymouth, Minnesota. • "I found a system where I can run a family-owned business with my wife, three children, daughter-in-law and stepbrother. We all work closely to make our business a success", Carl Jones, owner of Pirtek North Valley and South Valley, Colorado. • "Since we opened in 1999, our sales have increased an average of 67% per year", Eli Dorfman, owner of Pirtek Metro Detroit and Pirtek Westland, Michigan. • "Pirtek provides the opportunity for a small business owner to develop key customer relationships and maintain excellence in customer service", Dan Pridemore, owner of Pirtek Reading Road, Ohio.